This is an indispensable, fully illustrated reference to the cheeses of the world, with expert descriptions of the colour, texture, taste and background of each one. It includes over 150 classic and contemporary cheese recipes from international cuisines. It provides delectable ways of using all kinds of cheese from Mexican Tacos and Mozzarella in Carozza to Spanakopitta and Tiramisu. 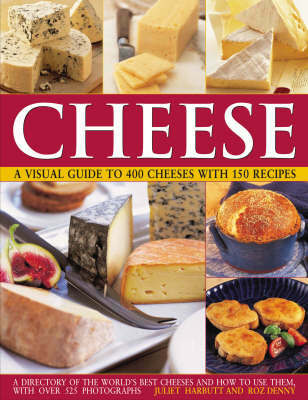 It features over 600 colour photographs, including spectacular cheese portraits and step by step instructions for the delicious cheese recipes. This extensive guide provides all-important information on what to look for when buying cheese; how to select the ideal cheese for cooking or eating; how to serve it and how to store it. This is followed by a comprehensive survey of the world's classic and modern cheeses. Essential details on each cheese describe its taste, appearance and texture; whether it is pasteurised, unpasteurised or vegetarian; and what it is best used for. Putting this information to excellent use, the second half of the book contains a superb selection of 150 step-by-step cheese recipes from all over the world. Included here are cheese recipes for every occasion, from soups, savouries, snacks and salads to vegetable dishes, main meal cheese dishes, pizzas, pastas, desserts and bakes.